I made these roasted veggies several times during the holidays, because they were yummy and extremely easy to make. This is an adaptation from a recipe I saw in Olive magazine, on my UK adorable subscription. Because everything is roasted there is not much of a hassle, I could do it on a lazy day as a vegetarian plate or as a side dish with a roasted chicken. I added the chestnuts to give a festive attitude but the whole combination of veggies are fantastic. You could have it without the cream but to me thats the special touch. 2 fennel bulbs, cut into slices. 150g of chestnuts, I used a packet of 5.2 oz all ready roasted and peeled. 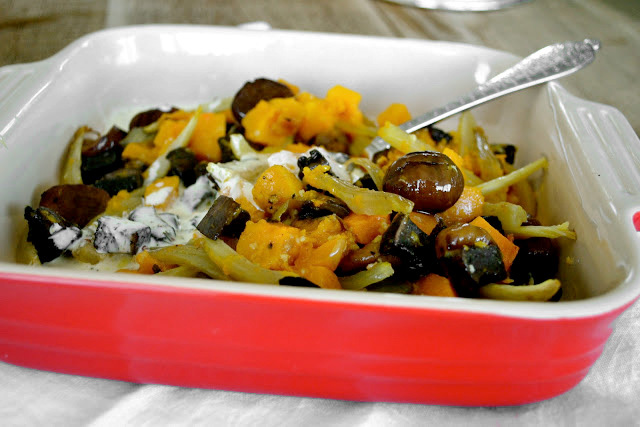 In a casserole toss the pumpkin, fennel, chestnuts with the garlic, bay leaf and olive oil. Seasoned with salt and pepper.Roast for about 20 minutes until tender. Meanwhile cook the portobello with the butter until any liquid that it has given off has evaporated. Reserve and toss in the casserole before serving. For the tarragon cream, in a small pan, heat the heavy cream with the mustard and tarragon and drizzle to serve. That looks amazing :). Yummy! roasted veggies are my favorite way to eat them! Hi Lola! I love roasted veggies and eat quite often especially in winter. I’d love to try your tarragon cream. Looks really delicious! Healthy and delicious. Like very much this kind of food, thanks for sharing the recipe. Love your roasted veggies..and tarragon cream yummy! Will try it sometimes! thanks Lola, and have a wonderful day!!! The chestnuts sound great with the vegetables! This is such a good winter dish. I enjoy roasted veggies so I appreciate your creative serving idea! I enjoyed checking out your very entertaining blog. 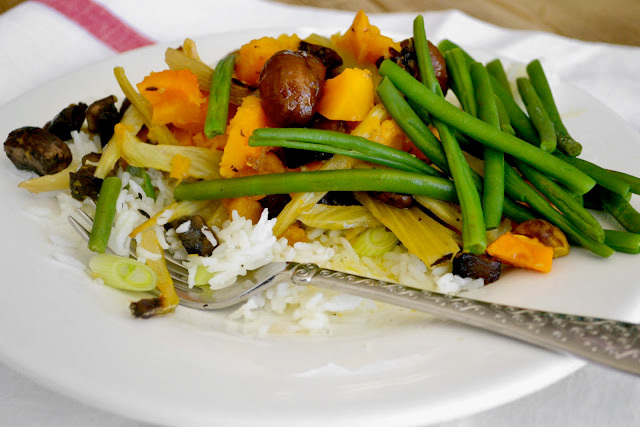 I love the idea of cooking the mushrooms separately…yum, yum! And the tarragon cream sounds outstanding! Scrumptious! Those look really good. Amo las verduras asadas para mí es una gran receta,todos los días estan en mi mesa son saludables,rápidas de hacer y de comer,abrazos abrazos hugs,hugs. I absolutely love roasted vegetables! They always smell so lovely when roasting away! I will have to give it a try. Roasted fennel is sooo great. This would make a fantastic vegetarian meal. I just saw a post earlier of pictures of roasted veggies and now I have come across this-surely it is a sign. This is a great blend of veggies for a side dish and the picture really does entice-I am ready to roast now! The dish looks delicious, but I especially love your addition of chestnuts. That must have smelled divine while roasting. Great combination of vegetables to roast! I have all of these… time to get roasting! This looks amazing! I especially like that you used pumpkin! Roasting vegetables is one of my very favorite ways to enjoy them!